I'm not a big fan of Roses and for that reason I don't really grow them in the garden. They seem like plants that are too fussy and prone to diseases but an exception is made for this Rose because they were gifted to me. This pretty common Rose can be found in landscapes all over the Chicago area and seeing them everywhere can get pretty boring. 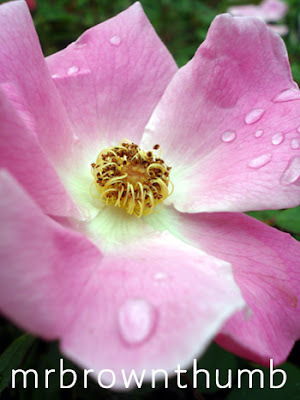 The inexpensive price of this Rose probably contributes to it's popularity among landscaping professionals who tuck this Rose everywhere from bank parking lots, schoolyards to road side planters. The biggest benefit I can discern from my experience with this Rose is the profusion of flowers that it produces all summer long with dead-heading, even in a shady spot I moved one to. The most common color for this Rose is pink but I've seen a couple of options in the garden center lately and I'd recommend it to an urban gardener that wants Roses but doesn't have the time or experience needed to grow them successfully.